At the crossroads between two 18-hole courses, amongst the most beautiful in Europe, the Golf du Médoc Hotel and Spa offers relaxing stays focused on golf and spa activities, as well as vineyards and gastronomy. The contemporary, friendly and warm decor is in perfect harmony with the surrounding area. More intimate areas allow guests to share cozy moments, with dinner or a glass of wine at the end of the day. 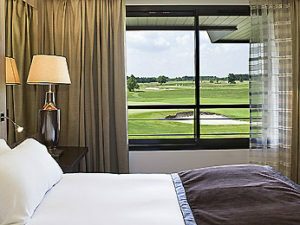 Overlooking the golf courses, the hotel offers exceptional views from the restaurants and rooms. Located in the world-renowned Médoc, the hotel is surrounded by some of the region’s best vineyards. 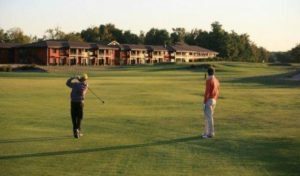 Golf du Médoc is located a twenty minute drive from Bordeaux airport and is therefore easily accessible. Surrounded by verdant grounds, the hotel is an oasis of calm and relaxation. The hotels main feature is its two magnificent 18-hole golf courses, which were voted the best courses in France in 2014 by the World Golf Award. Golf du Médoc is also ranked among the top 15 courses in continental Europe and has hosted several competitions such as The Final Challenge Tour and the Novotel Perrier Open de France. Combined, the courses comprise of 3.8 hectares of greens, all perfectly maintained throughout the year. Buggies, trollies, balls and clubs can all be rented from the resort and lessons can be organised in the modern coaching centre. Outside of golf, the hotel also boasts a sumptuous spa, with a professional team on hand to relax and refresh you. A series of treatments are available, alongside access to the spa’s heated swimming pool, hammam and fitness area. The hotel also offers two superb restaurants, a brasserie and gastronomic establishment. Both offer regional cuisine of all flavours, accompanied by an extensive and impressive wine list. Your food is enjoyed whilst overlooking the breath-taking views of the green. The staff in the restaurant, and throughout the hotel, are extremely friendly and attentive and their multi-lingual skills enable them to attend to your every need. Bathed in natural light, the bright rooms are decorated in a contemporary and simple style. The bedding and furniture are of natural tones, exuding a soothing atmosphere. The rooms offer all expected modern comforts, including WIFI, television, radio, as well as a mini-bar, tea and coffee making facilities and bathroom amenities.